Featured presenters to include Mark Eckert, Raging Granny Vee, David James Randolph, Leah Lubin, Andrew Mayer, Marcia Moonstar, Gaetana Caldwell-Smith, Joan Gelfand, and others to be named. Featured presenters to include Kirk Lumpkin and the Word Music Continuum, Jym Marks, the Beat Temple, Ava Bird, the George Orwell Experience, La Honda Films, Peter Sherburn-Zimmer, C. Theodore Walker, Tom Devine, Vic Lovell, Maria Medina, Leah Lubin, David Madgalene, Gaetana Caldwell-Smith, and Bruce Damer (Timothy Leary Archives). Poets, musicians and artists in 650 cities in 115 countries around the world are planning individual events to take place simultaneously on and about September 29th in a celebration of poetry, art and music to promote social, environmental, and political change. 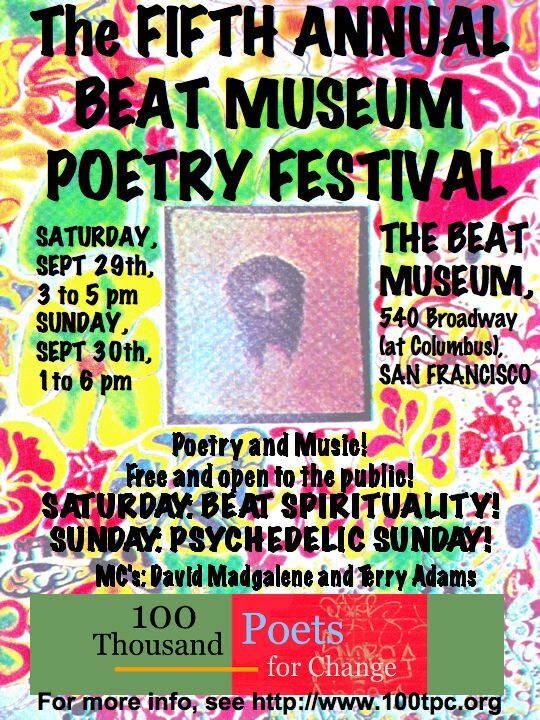 Along with championing World Peace and Environmental Sustainablity, the Fifth Annual Beat Museum Poetry Festival will spotlight two time-honored, although often neglected and/or overlooked harbingers of change, namely, Spirituality and Psychedelics. At the very heart of the Beat experience is the Way, the Path and the Road of Beat Spirituality. There could have been no Beat experience as it was known without its heartfelt and desperate Spiritual Quest. 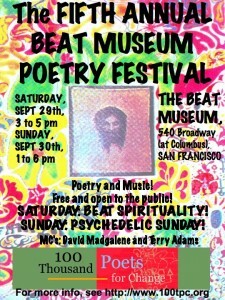 Join us Saturday as we celebrate Beat Spirituality! On Sunday, augmenting our superstar poets, we will feature multimedia performances with a psychedelic theme or influence—mind-expanding music, sounds, and lights! Join us Sunday as we celebrate Psychedelia! And join us for Poetry, on both Saturday and Sunday, that aspires to catalyze and manifest a better world for the common good of all God’s children!